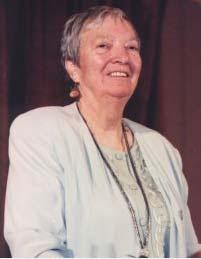 There are obituaries galore today for writer Madeleine L'Engle who died September 6, 2007 in Connecticut at the age of 88. They are interesting reading and remind me of several of the sixty books -- including Newberry winner, A Wrinkle in Time -- that Ms. L'Engle wrote over her long career as a writer of both fiction and non-fiction for children and adults -- indeed for readers of every age. But what they especially remind me of is that while Ms L'Engle may have died in a physical sense, very much of the essence of who she was and what she believed lives on. That's the way it is with writers. I had an editor for a number of years named Patricia Smith. She is well-known and highly regarded (to put it mildly) among those who have been privileged to work with her. She had -- and still has -- profound insight into writers and story. And she taught me a lot about the emotional landscape that I write out of. She made me appreciate it for the fertile ground that it is. In every writers' work, long after the writer herself is no longer, vestiges of that emotional landscape live on. So, though I am saddened by Ms L'Engle's passing, I am grateful for the gift of her books, of her sharing her own emotional landscape with readers of the past, present and future. I didn't read her books until my own children were reading them. But they were as rich a fare for me then as they would have been had I read them as a child. Possibly they were richer because I brought more with me to their reading. I'm sure my daughter who has read them over and over feels the same way. Ms L'Engle's fiction was always fascinating, engrossing and demanding. Not for the faint-hearted, I would say. When I was working on my master's thesis on children's literature and theology, I often came back to her because there was such a dimension of faith in her works. Theoretically she often wrote "for children" but she was often quoted as saying she wrote for them because what she had to say was too difficult for grown-ups to comprehend. I'm not sure about that. But I do believe that she wrote out of a profound sense of the individual's place -- and importance -- in the universe. And she believed in the power of love. She once asked, "Why does anybody tell a story?" And then she answered her own question. "It does indeed have something to do with faith -- faith that the universe has meaning, that our little human lives are not irrelevant, that what we choose or say or do matters, matters cosmically." I think a lot of writers would say that about their work. And while my own books may be very different from Ms L'Engle's, I know that I share that faith. I also believe in the power of love. Rest in peace, Ms L'Engle. Thank you for sharing your emotional landscape with generations of readers worldwide. Your work will speak for you for many years to come. RIP Madeleine L'Engle. And thank yuo from me too. Madeline L'Engle was a great writer. I enjoyed not only her Wrinkle inTime books but alos her non fiction essay books. When I was at university, I was lucky enough to hear her speak. But you are so right when you say her words will live on. I'd missed this, too. And I loved her Wrinkle in Time books when I was little. RIP Madeleine L'Engle. And her words will definitely live on.